Click on the picture or the video play button. What are the differences in how these poems are read? Use what you hear and see to help you answer this question. What kind of mood does this poem or song put you in? Does this mood match the words you hear in the poem or song? Was it easy or hard to understand this poem? Why? Which illustrations do you like better? Why? Why do you think the author wrote this poem? 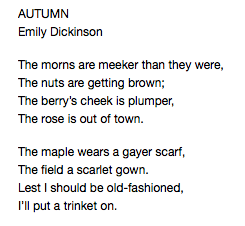 Why did Emily Dickinson say the berry's cheek is plumper? Does a berry have cheeks?